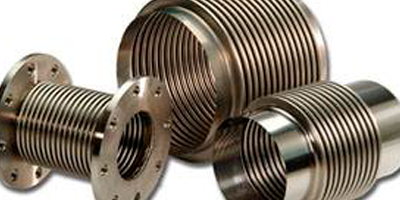 Series FFB Free-Flexing Expansion Joints are manufactured using multi-corrugation metal bellows, and flanged or weld type end connections. Accessories such as tie rods, limit rods, flow liners, and covers can be added, depending on the application. 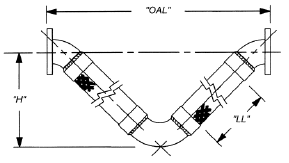 Free-flexing expansion joints are used to control axial pipe movements that typically arise due to thermal expansion. Limited lateral offset, angular rotation, and vibration isolation can also be accommodated. Mid-corrugation bellows are an economical choice when average movements are experienced. High-corr bellows should be used to absorb greater movements. Where expected motions are greater than what a single bellows can accommodate, dual bellows with a center anchor base can be used. Bellows pressure carriers include low pressure exhaust bellows, 50 psi, 150 psi, and 300 psi. Single ply bellows are standard. Multi-ply bellows are well suited for those applications requiring low spring rate or where cyclical vibration may be a problem. Standard materials include T304, 321, and 316 stainless steel, as well as Inconel, Monel, and other alloys. Meets MIL-E-17813F Type 1, Class 1 and Class 2. 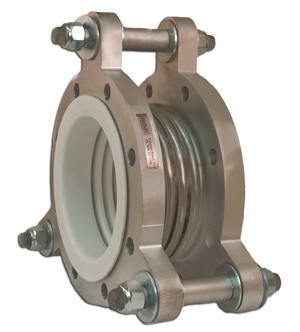 Series FFB bellows expansion joints are designed and constructed per application to meet specific design requirements regarding combinations of pressure, temperature, motions, and cycle life. 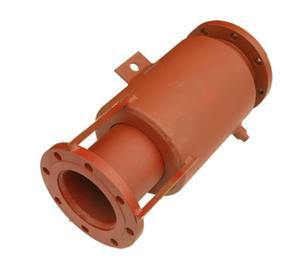 All Series FFB bellows are manufactured in accordance with the Expansion Joint Manufacturers Association (EJMA). Up to 300 PSIG 2″ to 144″ diameter 304, 321, or 316 stainless steel, Inconel, Monel, or other alloys Fixed flange, floating flange, or beveled weld end style EJMA, MIL-E-17813F Type 1 Class 1 & 2. ASME welding standards. Series CF Controlled Flexing Expansion Joints combine high-corrugation free flexing bellows with mated neck rings, and equalizing or control rings. This heavy-duty construction allows their use with higher pressures and larger axial movements than a standard high-corr unit would be able to accommodate. Each of the equalizing rings that fit into the corrugations are extended in a “T” shape over the bellows. The tops of these rings will begin to make contact when the bellows are compressed, spreading the movement equally over each convolution. Bellows squirm and buckling is controlled. 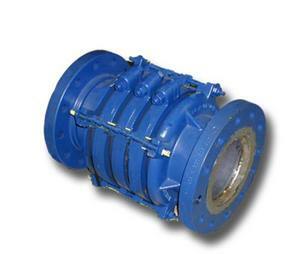 Controlled flexing expansion joints are ideal for steam piping to compensate for thermal growth. Selections include either 150# or 300# bellows, and in single or dual configuration. End fittings can be plate flange, forged flange, or weld ends. Controlled-flexing joints are rated for full-vacuum, and temperatures from -20 to 800°F. Meets MIL-E-17813F Type II Class 1 or 2. Specified by consulting engineers and building owners and installed by contractors throughout the world for many years, Unisource V-Loops solve the problems of pipe motion caused by thermal pipe growth and the unpredictable movements associated with seismic activity. Unisource V-Loops can perform the functions of large pipe loops or expansion joints, and in addition, can provide protection and flexibility in multiple planes during potentially catastrophic earthquakes. Unlike large pipe loops, Unisource V-Loops take up a minimum of space, providing pipe motion accommodation solutions in limited space situations such as indoor piping. The small configuration of the Uni-Loops are also far less susceptible to the heat loss that must be dealt with in the case of large pipe loops. Whereas metal bellows or rubber expansion joints will impose substantial anchor loads due to the effects of static pressure thrust, Unisource V-Loops will not introduce any thrust loads on the piping system. The unique construction of the braided V-shaped loop creates a flexible product that does not expand when pressurized. A welded-on braid acts as a restraining device, even at extended pressures, yet allows tremendous flexibility. Anchor loads in regard to the Unisource V-Loops are confined to the relatively small spring forces required to deflect the flexible legs within the loop. Unlike expansion joints, a minimum of pipe guiding is required. Unisource V-Loops are extremely easy to design in nested configurations. Due to the inherent V-design, standard Uni-Loops can simply be nested within each other with relatively tight centering. 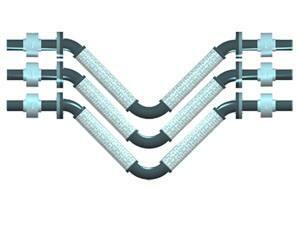 A substantial amount of space can be saved, and since no additional pipe extensions need to be installed in the Unisource V-Loops, standard models can be used, saving cost and reducing delivery time. The standard position for the Unisource V-Loop is in a horizontal pipe run, with the elbow pointing straight down. Positioning is versatile, however, and the loops can be installed in many other positions such as laying the loop horizontal, positioning the elbow straight up, or positioning for vertical pipe run. In installations other than the standard position, Unisource can provide a support eyelet to allow a cable or rod to support the weight of the loop and its contents. Unisource V-Loops can be used for a variety of fluids and gases. Loops can be constructed using stainless steel hose and braid with carbon steel end fittings and elbows, or with bronze hose and braid with copper end fittings and elbows. End fitting options include flanges, male threads, beveled weld ends, grooved ends, and copper sweat. Use Uni-Loops for applications such as heating and cooling water in HVAC systems; moderate velocity steam; natural gas; medical gases; fire sprinkler piping; and selected process applications. Drain ports can be added where required. For higher pressure applications, Unisource V-Loops can be constructed using double braided hose legs. Consult Unisource for specific pressure ratings. Standard Unisource V-Loops are offered for either 2”, 3” or 4” of motion from center-line in axial and offset planes. Loops for even greater motions can be constructed upon request. All Unisource V-Loops are shipped complete with installation instructions wire tagged to each product. Unisource offers loops for applications under the auspices of the CSA/AGA, NFPA, and U.L. Unisource V-Loops are an ideal option for compensating for thermal pipe growth. Often, thermal pipe growth must be absorbed in piping systems where the substantial anchoring systems that bellows expansion joints would require are not present. Since these “V” shaped flexible hose loops do not impose pressure thrust forces on the anchoring system, anchor loads are very low. The only forces involved are the spring forces required to flex the loops. Uni-Loops are an in-line connector and consist of a 90-degree pipe elbow with a flexible stainless steel or bronze hose leg connecting to each end of the elbow. 45-degee pipe elbows are located at the ends of the flex leg and end fittings are welded to the 45-degree elbows. End options are flanges, pipe threads, beveled weld ends, grooved ends, and copper sweat ends. Standard “Uni-Loops” are rated for either 2”, 3”, or 4” of motion, but can be build to absorb greater movements. Since Unisource V-Loops do not impose thrust forces on the pipe system, a minimum of guiding is required. For steam applications, a drain port can be added at the center elbow. Loops can be configured with the 90-degree elbow hanging straight down or with support at the 90-degee elbow, can be positioned in an inverted position, horizontal, or in a vertical riser application. See the HVAC section under Special Market Focus more more information and submittal on Unisource V-Loops. A flanged end loop with carbon steel Class 150 plate flanges as standard ends. Raised face flanges (Series 421) or virtually any other flange configuration can also be ordered. Schedule 40 carbon steel elbows are also standard, but can be specified in other materials. As in other configurations of Unisource V-Loops, choose from either 2” or 4” of motion from center-line. For steam service, Unisource recommends placing the loops in either an inverted or horizontal installation when conveying steam. A drain port should also be specified for steam service. Unisource can also add an eyelet at the 90 degree elbow to accommodate a support rod or cable. Pre-designed in sizes from 1-1/2 inch through 12 inch. Available in custom construction up to 18 inch diameter and in movements as great as 24 inch. Series 425 is a loop with carbon steel male NPT threaded ends as standard. Female union ends can also be specified (Series 426). As in other configurations of Unisource V-Loops choose from either 2” or 4” of motion from center-line. For steam service, Unisource recommends placing the loops in either an inverted or horizontal installation when conveying steam. A drain port should also be specified for steam service. 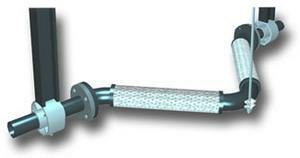 Unisource can also add an eyelet at the 90-degree elbow to accommodate a support rod or cable. Series 430 loops are configured with carbon steel schedule 40 beveled weld ends as standard. As in other configurations of Unisource V-Loops choose from either 2” or 4” of motion from center-line. For steam service, Unisource recommends placing the loops in either an inverted or horizontal installation when conveying steam. A drain port should also be specified for steam service. Unisource can also add an eyelet at the 90 degree elbow to accommodate a support rod or cable. Series 435 Unisource V-Loops loops are constructed with carbon steel standard grooved ends for easy installation. As in other configurations of Unisource V-Loops, choose from either 2”, 3” or 4” of motion from center-line. Unisource can also add an eyelet at the 90-degree elbow to accommodate a support rod or cable. Series 455 Unisource loops are designed specifically for copper piping systems. They are constructed with copper female sweat ends and copper elbows and either stainless steel braided hose or bronze braided hose, depending on size. Those loops using stainless steel braided hose will also utilize stainless steel 90-degree return elbows. Unisource Series 445 threaded and Series 450 weld-end V-Loops are designed specifically for natural gas piping and are certified by CSA International for gas piping applications (Certification Report No. 190623-1131571). 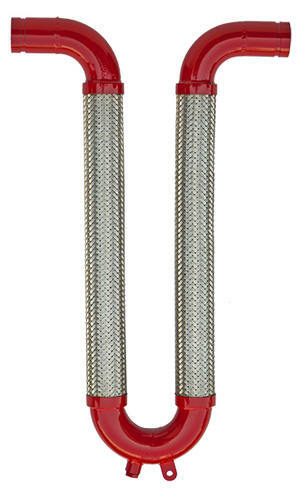 Series 445 and Series 450 gas loops are constructed with stainless steel hose and braid, carbon steel Sch 40 elbows and either male NPT ends (Series 445) or beveled weld ends (Series 450). Unisource gas loops are rated for minimum working pressures of 150 PSIG, with extremely high burst to working pressure ratios. Series 445 and Series 450 V-Loops are rated for 4” of motion from center-line. Size range is from 1/2” through 4”. 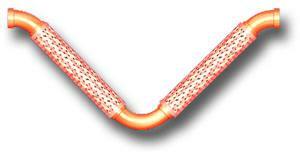 “MedFlex” loops are constructed with bronze hose and braid, copper return elbow, and copper sweat end connections. Sizes 2-1/2” through 4” utilize stainless steel hose and braid, stainless steel return elbow, and copper sweat end fittings silver brazed to the assembly. Unisource V-Loops can be included into specific seismic bracing designs for submission to the California Office of Statewide Health Planning and Development (OSHPD) for use in health care facilities. 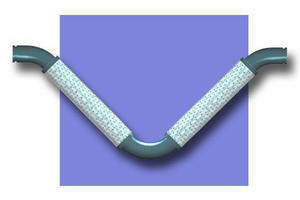 Like other Unisource V-Loop products, “MedFlex” loops are capable of motion in all directions. Due to the unique design, “MedFlex” loops can be installed anywhere that building motion or pipe movement may be experienced—seismic applications, thermal pipe growth, or building settling. The “MedFlex” loop is versatile. It may be installed in a variety of configurations and can even be nested to save space. Whereas metal bellows or rubber expansion joints will impose substantial anchor loads due to the effects of static pressure thrust, Uni-Loops will not introduce any thrust loads on the piping system. 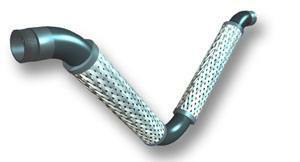 The unique construction of the braided V-shaped loop creates a flexible product that does not expand when pressurized. A welded-on braid acts as a restraining device, even at extended pressures, yet allows tremendous flexibility. Anchor loads in regard to the Uni-Loops are confined to the relatively small spring forces required to deflect the flexible legs within the loop. Unlike expansion joints, a minimum of pipe guiding is required. Unisource V-Loops are extremely easy to design in nested configurations. Due to the inherent V-design, standard Uni-Loops can simply be nested within each other with relatively tight centering. A substantial amount of space can be saved, and since no additional pipe extensions need to be installed in the Uni-Loops, standard models can be used, saving cost and reducing delivery time. The standard position for the Uni-Loop is in a horizontal pipe run, with the elbow pointing straight down. Positioning is versatile, however, and the loops can be installed in many other positions such as laying the loop horizontal, positioning the elbow straight up, or positioning for vertical pipe run. In installations other than the standard position, Unisource can provide a support eyelet to allow a cable or rod to support the weight of the loop and its contents. Unisource “FireV” flexible seismic loops are built to accommodate the unpredictable movements of fire sprinkler piping during seismic incidents. The innovative designs of our “FireV” combines flexible, braided stainless steel hose and braid with piping elbows to provide an engineered solution to seismic movement, while not requiring a change of direction. Tested and listed by U.L. (Underwriters Laboratories) for fire sprinkler applications, Unisource FireV loops can absorb as much as 24″ of seismic motion in all three planes of movement. Also, unlike any other fire sprinkler loops on the market, the vee-configuration allows for fire sprinkler piping to be nested within other adjacent V-Loops. This feature saves space and eliminates the need for successively longer pipe extensions at the base of the loop. Basic “FireV” construction includes Schedule 40 carbon steel 90-degree center elbow and 45-degree elbows at either end (eliminating the need for a change of piping direction). End fittings can be carbon steel grooved ends, carbon steel male NPT, carbon steel beveled weld end, and carbon steel flanges. Our standard listed seismic movement limits are generally 4-inches, 8-inches, or 24-inches, but any rating within 24-inches may be specially ordered. Each “FireV” loop is labeled with the appropriate U.L. identification, listing number, and part number. “FireV” loops are 100% pre-tested to U.L. standards prior to shipment and are shipped with installation instructions wire-tagged to the loop. Special shipping containers are used at no additional cost to protect the loops during shipment and during job-site storage. Sizes range from 1/2-inch through 8-inch diameter. Styles include 47-47 flanged, Series 40-40 threaded, Series 55-55 grooved, or Series 42-42 beveled weld end. Unisource “FireV” U.L. rated fire sprinkler loops are also listed for use in Canada. A tried-and-true stainless steel braided flexible seismic loop for fire sprinkler systems. Unisource “FireU” flexible U-shaped seismic loops are built to accommodate the unpredictable movements of fire sprinkler piping during seismic incidents. The innovative designs of our “FireU” combines flexible, braided stainless steel hose and braid with piping elbows to provide an engineered solution to seismic movement, while not requiring a change of direction. Tested and listed by U.L. (Underwriters Laboratories) for fire sprinkler applications, Unisource FireU loops can absorb as much as 24″ of seismic motion in all three planes of movement. Basic “FireU” construction includes Schedule 40 carbon steel 180-degree center elbow and 90-degree elbows at either end (eliminating the need for a change of piping direction). End fittings can be carbon steel grooved ends, carbon steel male NPT, carbon steel beveled weld end, and carbon steel flanges. Our standard listed seismic movement limits are generally 4-inches, 8-inches, or 24-inches, but any rating within 24-inches may be specially ordered. Each “FireU” loop is labeled with the appropriate U.L. identification, listing number, and part number. “FireU” loops are 100% pre-tested to U.L. standards prior to shipment and are shipped with installation instructions wire-tagged to the loop. Special shipping containers are used at no additional cost to protect the loops during shipment and during job-site storage. Sizes range from 1-1/2-inch through 8-inch diameter. or Series 42-42 beveled weld end. Unisource “FireV” U.L. 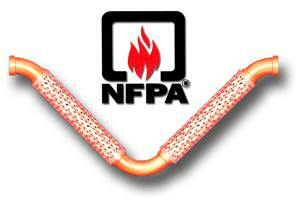 rated fire sprinkler loops are also listed for use in Canada. Series EP Externally Pressurized Expansion Joints are used in straight runs of pipe to accommodate large amounts of thermal expansion. Typical applications would include steam systems, where extreme temperature differentials would cause thermal growth of the piping system. Series EP expansion joints are a packless, maintenance-free joint that incorporates an all stainless steel flexible bellows, a steel enclosure, with external and internal guide ring/sleeve to maintain alignment of the inner pipe. The sleeve isolates the bellows from media, eliminating flow turbulence. External pressure is applied to the bellows via a gap between the internal flange and housing. Movement limitation is accomplished by means of an internal flange, and also guides the bellows along the longitudinal centerline. The external pressure keeps the bellows stable. Externally pressurized expansion joints have significant advantages over pipe loops because they are able to absorb very large axial movements and take up far less space than pipe loops. Typically these applications are indoors, in utility tunnels, or buried where extra space is not available. Series EP joints also are frequently specified instead of slip joints that are also engineered for large movements because of several factors. Slip joints are a packed product that required periodic inspection and maintenance. Access vaults are always required for packed joints. Series EP externally pressurized joints are of a packless, all-welded construction that does not require inspection and can be installed in remote locations or even directly buried. Unisource Series EP externally pressurized expansion joints are a long-life quality piping product that carries a Five-Year Limited Leak-Free/Maintenance-Free Warranty. Contact Unisource for details. Select either 150 PSIG or 300 PSIG bellows construction. Single bellows styles are available for 4″, 6″, or 8″ of axial travel. DFlanges or weld end are additional options. Meets MIL-E-17813F Type II Class 4. Standard bellows are constructed of single ply or multi-ply Type 304 stainless steel and are suitable for most chloride free applications such as steam, condensate, oil, and chilled water. Where chlorides may be present, Inconel 600 bellows should be specified. Special bellows material would include 316SS, 321SS, Inc 600, and Inc 625. Other bellows alloys are available upon request. Pipe and end connections are plain steel. Series EP Externally Pressurized Expansion Joints are used in straight runs of pipe to accommodate large amounts of thermal expansion. The Series EP dual expansion joints utilize two sets of bellows with a center anchor base, effectively doubling the axial motion capability of a single expansion joint. Dual units are rated for either 8”, 12”, or 16” of axial travel. Anchor base is stanadard. Select either 150 PSIG or 300 PSIG bellows construction. 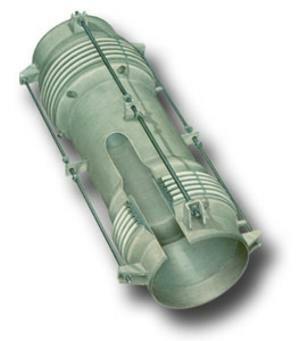 Single bellows styles are available for 4″, 6″, or 8″ of axial travel. Flanges or weld end are additional options. Ultralon is a problem solving product in many high temperature applications. Unlike ordinary solid PTFE or elastomeric joints, should up-set conditions exceeding 500 °F occur, Ultralon will maintain its pressure carrying capacity up to 1200°F—long enough for system shut-down and replacement. The construction of the Ultralon expansion joint utilizes a stainless steel, Inconel, Monel, or Hastelloy bellows in combination with a PTFE lining formed into the bellows during manufacture. Ultralon expansion joints can offer working temperatures from -300°F to +400°F, and a choice of bellows rated for working pressures of 50, 150, or 300 psi. Gimbal, hinged, dual externally pressurized, and pressure balanced styles are construction options. Flanges are available in carbon steel, stainless steel, or Teflon coated. Ultralon expansion joints can be manufactured in custom overall lengths and in custom movement capabilities. Consult Unisource for information on the special construction you need for your application. Unisource can design and build all types of special metallic expansion joints, such as universal styles, hinged, gimbaled, pressure balanced, rectangular, tied, and shrouded styles. Contact Unisource with your application data. Series PG Pipe Alignment Guides should always be used in conjunction with expansion joints. Pipe alignment guides help to control the motion of pipe and expansion joints, insuring that the joint is subject only to the deflection for which it was designed. Unguided piping, under pressure will tend to buckle, sometimes severely. This buckling would deter the expansion joints from working properly. Guides permit unobstructed axial movement of the pipe while restricting lateral, angular, or buckling movements. Standard spider guides are manufactured to accommodate specific amounts of movement and insulation. 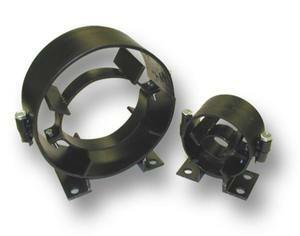 A pipe guide assembly consists of an anchored housing and a sliding spider that is attached to the pipe. The spider moves through the housing as the pipe expands and contracts. Guides are carbon steel painted for rust protection. Additional items in this series include pre-insulated guides, pipe slides and bases, anchor clamps, baseboard fin-tube guides, baseboard anchors, and hinged series. The information on the brochure below is important basic guidelines to consider when placing expansion joints into a piping system. When bellows expansion joints are being considered to absorb pipe movements, concepts such as pressure thrust force, spring forces, pipe guiding, and anchoring need to be thoroughly analyzed. In addition, pipe movements due to thermal changes or other situations must be accurately calculated. The attached brochure will assist in determining the proper expansion joints and piping components.